My upcoming book, Not Really A Princess, is a redemption story of three women and their journey through trials to find inner joy. My moma was the inspiration for this story. She lived a very hard life enduring many struggles that would have pulled under the strongest of souls. My growing up years had several tragedies that created a depressed atmosphere for my sister and I. I admit to growing bitter and upset that things were so difficult. Through faith in Christ our hearts all began changing. This did not happen overnight but gradually through years of forgiving, loving and claiming God's promises for us. In 1 Corinthians 13:5 it states, "...It (love) does not seek its own, is not provoked, does not take into account a wrong suffered". Many people have quoted this chapter at all kinds of events through the centuries but this verse has always been the part that stands out the most for me. By being angry, hurt or unforgiving we are being selfish. So when I feel upset because a loved one or friend has hurt me, I quote this in my head----does not seek its own, does not take into account a wrong suffered. I say those phrases over and over. Then I thank God for whomever has injured me. And then it seems much easier to get past the hurt. My moma grew and became filled with love and joy for everyone around her. In her last 30 years she CHOSE to turn the page on the cruelties of life and be filled with inner peace. 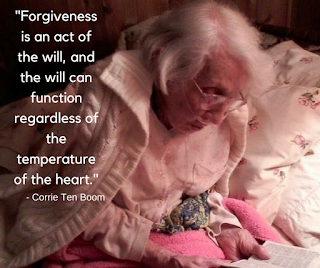 She sat on the edge of her bed every night to her last days at 97 years old. 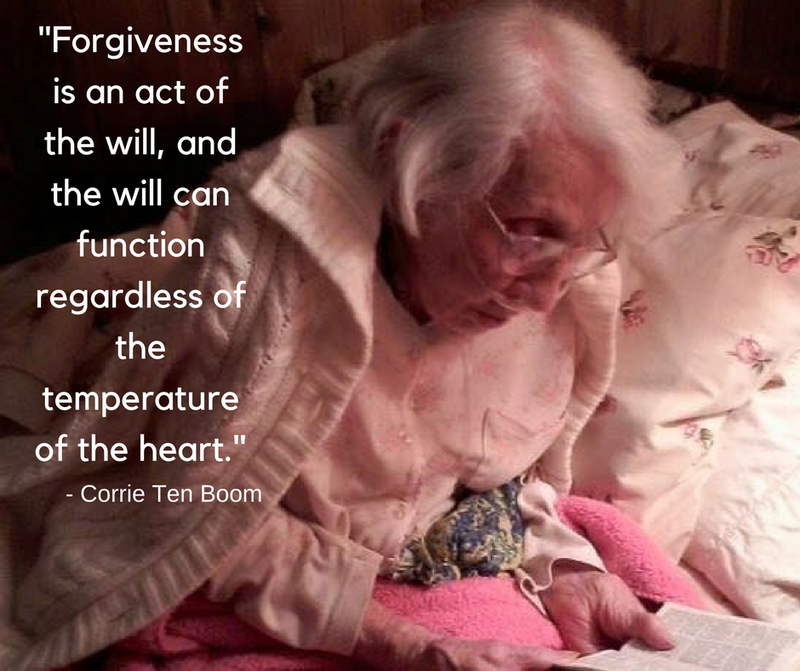 She read the Word, her Daily Bread excerpt for the day and many times her Corrie Ten Boom book. She did not miss a day for tiredness or for being too busy. God honored her faithfulness. I desire this joy for myself and for all of you.